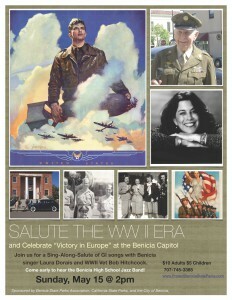 This Sunday, join eleven of our local World War II veterans for a festive day at the Benicia State Capitol. Join the Sing-Along-Salute of GI songs to salute the WWII era Victory in Europe with lead singer Laura Dorais and keyboardist Rodney Burge. The Benicia High School Jazz band will provide music in the front lawn beginning at 1:00. The performance will be at 2:00 pm in the Benicia State Capitol Senate Chambers. $10 Adults and $5 Children. Songbooks will be provided until they run out. Sponsored by Benicia State Parks Association, California State Parks, and the City of Benicia.